Sansthan planeed and executed a systematic arrangement called Darshan Bari for numerous devotees coming to holy town shegaon for Shree's Samadhi Darshan. It is a soothing sight to see that the devotees in such a large number march ahead peacefully without any chaos for darshan. The systematic and disciplined arrangement is the unique feature of Darshan Bari. It has the facilities of branches, Fans and cooling, drinking water etc, for comfort of devotees,which enables them to stay in a queue. Shree's Mukh Darshan is an innovative outcome of Sansthans planning which enables the senior citizens, handicapped people, those suffering with ailments or the devotees who want to rush back urgently to have Shree's Darshan peacefully. Thus no one is deprived of the fortune of Shree's Darshan. Through this arrangement, the devotees feel completely satisfied to meet beloved Maharaj. 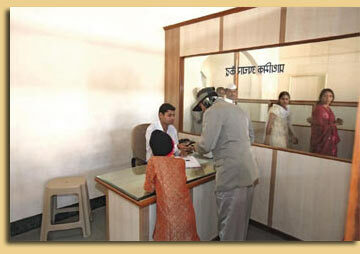 The first aid renders the timely medical service to the devotees as and when required. Female devotees with hungry, crying babies feel restless. 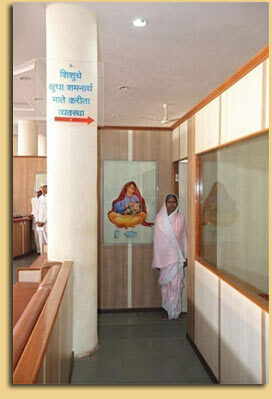 Sansthan had a great vision of it and hence a special arrangement is made for mothers to attend hungry babies. 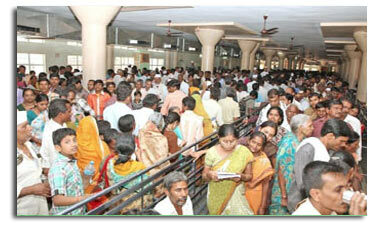 A hot cup of Tea at free of cost totally refreshes tired devotees in a queue. During crowed teais distributed here to devotees. The devotees in a queue feel very comfortable with the arrangement of air ducting coolers at various places in darshan bari (queue). 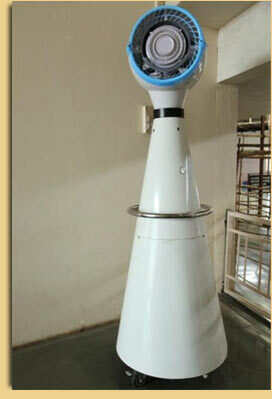 There is an arrangement of toilets for devotees. Along with this Sansthan placed wooden racks nearby toilets for keeping the offerings (garlands, Prasad etc. )when devotees using toilets.